Figure 32.2. sFLC concentrations in normal sera and in 37 patients with WM at the time of plasma exchange for hyperviscosity syndrome. FLC proteinuria occurs in up to 70% of WM patients. However, the amounts excreted are usually low and do not relate particularly well to changes in tumour burden . In contrast, the sFLC assay is informative in the majority of patients (Figure 32.2) . 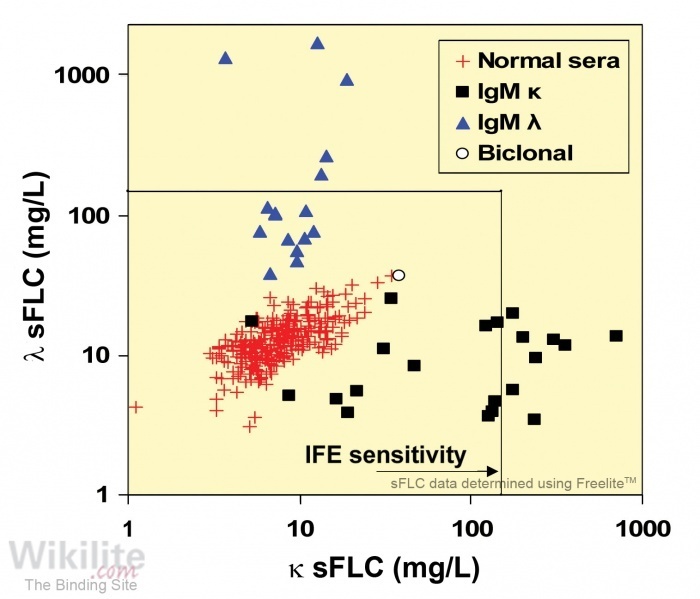 Importantly, sFLCs do not cryoprecipitate and are not affected by other factors that can make IgM measurements difficult . Itzykson et al. assessed sFLCs in 42 WM patients prior to treatment. The median involved FLC (iFLC) concentration was 48.6 mg/L (range 11.3 - 19400 mg/L), and was elevated above the normal range in 83% of patients. The iFLC and IgM monoclonal protein concentration were not related to each other (p=0.89), similar to findings in multiple myeloma patients (Sections 11.2.5 and 17.2). Whilst guidelines state that sFLC analysis is not essential for the routine assessment of WM patients , in practice, it is routinely used by many clinicians in this context . A recent survey of haematologists and oncologists in the Netherlands revealed that 43.4% currently measure sFLCs in the diagnostic work-up of patients with suspected WM .